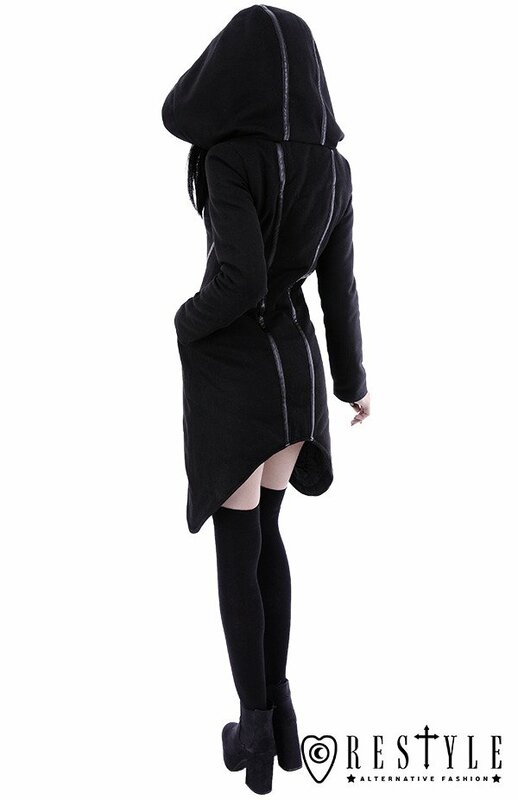 Black gothic winter coat with pockets, huge hood, jacket "ASSASSIN COAT"
You save 31% (31,14 €). This instantly flattered coat is made of very thick and firm cloth (65% polyester 35% wool). 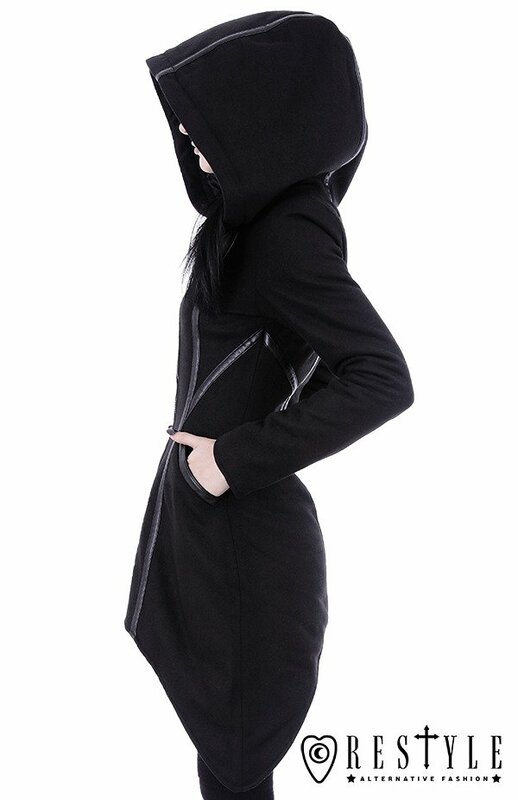 Very beautiful outwear which gives a beautiful silhouette. Jacket is fully warmed with polyfill 100g, great for winter weather without feeling "puffy". Black zipper closing ended with crescent moon. faux leather trimmings keep the style smart and sophisticated. 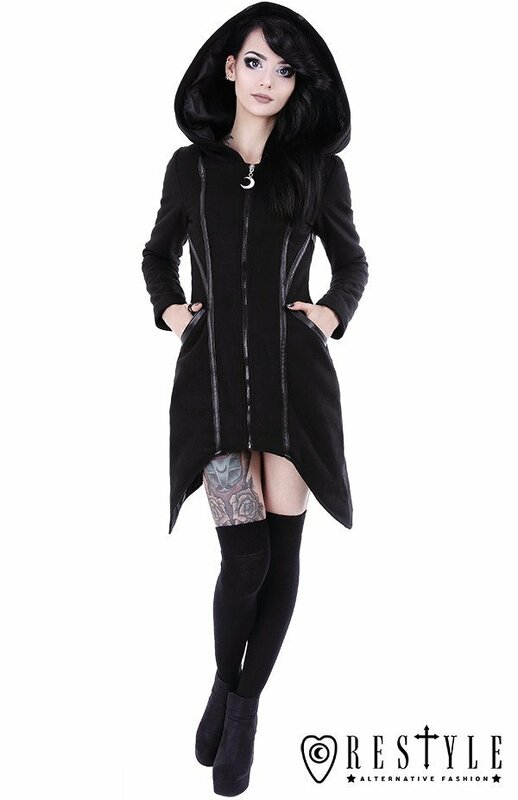 Assasin coat can be dressed up for special occasions or for everyday use. 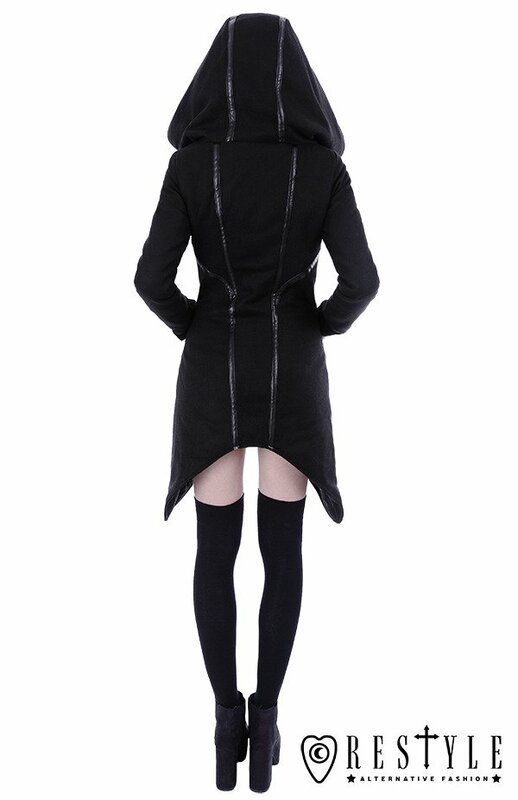 Jacket has huge hood also adorned with faux leather trimmings. Coat has side pockets. I ordered a size larger as my size was sold out and I thought it would be handy to fit extra layers underneath when the freezing weather comes. I'm very happy with it, it fits a jumper underneath and is still not too baggy. And doesn't feel too thick, it's breathable but also very nice and cozy and warm! The hood is nice and huge, so I have no problem fitting it over my dreadlocks, even when I'm wearing my hair up. Very happy indeedy. Very warm coat with big pockets. I got a larger size than I normally wear, as that was all that was in stock. I don't mind though, as the sleeves seem a snug fit and a smaller size may have been too small in the arms. The larger size does not give as much shape to the waist as in the pics, but I quite like the looser fit and the longer length on me (sides fall below the knee). Soft cosy material, quality lining and well-made. Beautiful and really warm. I love it! Received it yesterday, October 30, ordered it the 24th, so very fast shipment from Poland to Belgium within only one week! Love the coat, it's nice and warm and I'm glad I ordered XL for it to be a bit looser since I go to work on my bike and I don't want it to be too tight. It's a perfect choice! (I usually wear a size M/L) Thanks Restyle team, you made my day! The coat is super warm and comfy. 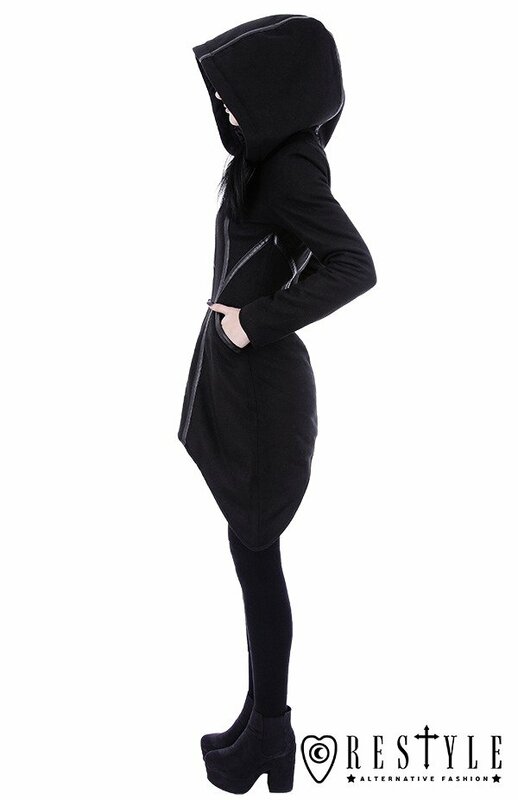 I ordered a size up ,so it's a bit large at the waist area but i can wear any hoodie or sweater underneath if the weather turns really cold. The design and the details are gorgeous, love it. Really high quality, cosy and warm so is perfect for winter, and pretty waterproof. The hood is enormous, so sometimes falls down over the eyes but as long as you position it properly it isn't an issue. I ordered a size up but I'm short so it is pretty long on me, ordering my actual size would probably have been fine. Definitely recommend, a perfect coat for the winter/autumn months. I bought this coat and can't stop wearing it whenever is cold outside. It has become my absolute favorite! Very comfortable and gives you a flattering shape while keeping you warm because it's really warm inside! Another of the best purchase's I've done. It's good quality, charming style, super cute moon charm in the zipper and true to size, fits perfectly and you can layer underneath comfortably! 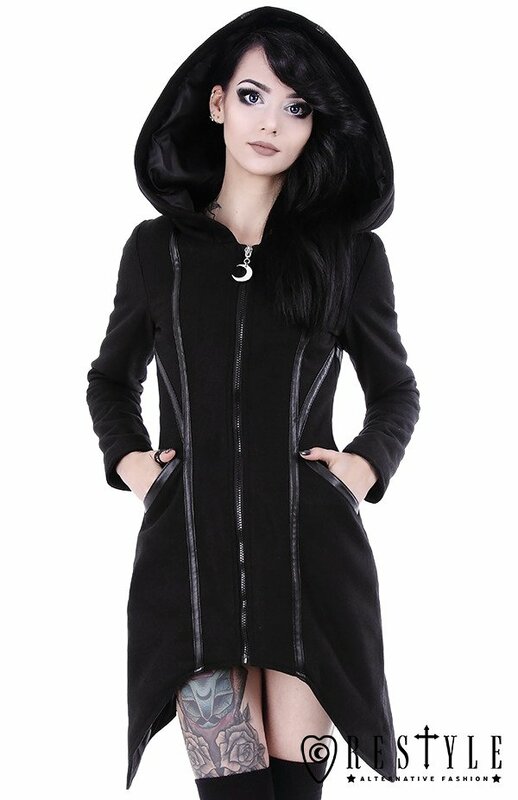 I decided to get this for winter because you can never have too many jackets. It's much heavier than I expected which is good because it's been keeping me warm this winter. 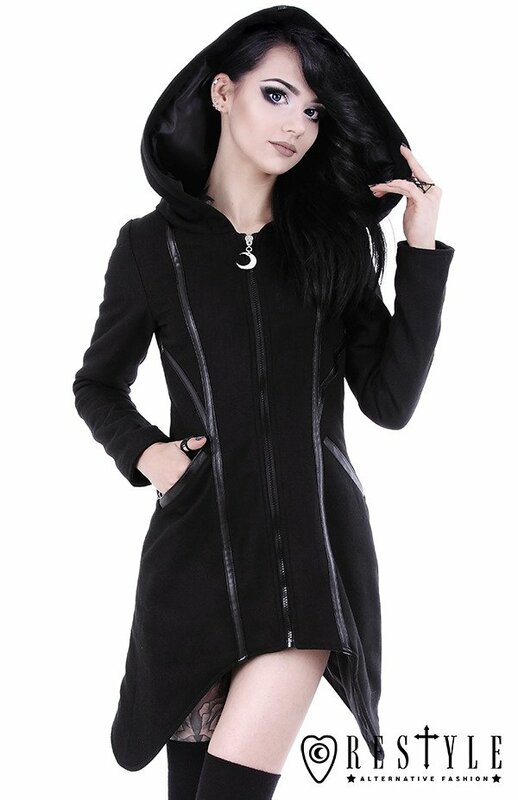 The material is very soft and the zipper's pull charm is a cute touch. I got a small because I'm petite and it fits well other than the sleeves are bit snug but it's not a big issue. I love this coat. It is lined and thick, so it will keep you warm for fall and spring weather. Because of the lining and material, it does fit on the smaller side, so I would recommend going a size up if you are unsure.